Paridhi Mathur, dusky, beautiful, and (determined to be) single, is doing everything to keep her academic records high and her love life nil, but lady luck keeps frowning at her. When she meets Abhigyan Ambastha, rich - devastatingly handsome, intense and sometimes curt, her resolve wavers. Despite regular warnings from her ever-suspicious heart, she inexplicably gets attracted towards him. But she would not let him trespass her soul. Why? Is she scared of mendacious face of love her past has inflicted on her? Can Paridhi really trust Abhigyan? Will a blissful breeze of love ever kiss her heart? A heart-warming saga of dreams and desires, We Will Meet Again promises to make you smile and cry at the same time. Hold on to your hearts before embarking on this roller coaster ride of emotions! If I could describe the novel in few words it would be – light and breezy romantic read. I had downloaded the book on kindle when it was available for free one fine day and soon forgot about it. After a few days, I had to take a flight journey with my toddler and luckily my baby boy slept most of the time during the travel. That’s when I started reading this book (these days I get to read only when my baby sleeps) and when I was home I utilized every opportunity to finish the book. The story is infectious; once you start reading it you feel the need to know what happens next. I must add here that the story line is not something out of the box – in fact it is quite predictable and the plot is linear too. 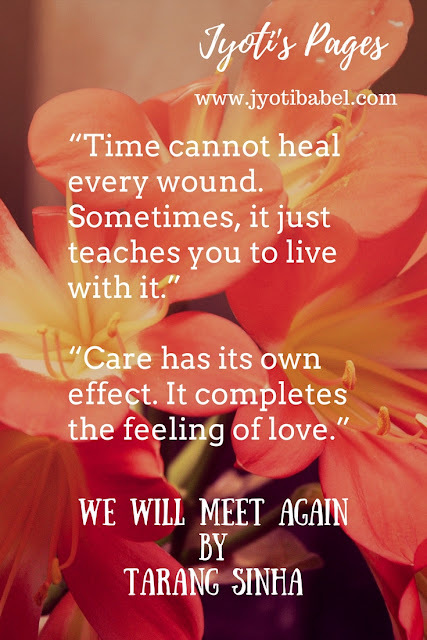 But, there is something about the book that connects it with the readers instantly. It is the author’s writing style and the characters in the novel which struck a chord in my heart and made the reading very enjoyable for me. I strongly have a feeling that the author is inspired by people around her to build all of them. One thing that could have been done away with in the book are the typos and editing errors – they can ruin an otherwise good book. Paridhi is a simple and down-to-earth girl. Her character is very well sketched by the author. The way her relationship with her father, sister, her best friend, etc., is portrayed, various shades of her character bloom. Various incidents throughout the story also bring out the finer details - how protective she feels for her family, how it hurts her self-esteem when someone not from the family offers her monetary help, etc. However, I was hoping for a stronger reason in her past which makes her determined to stay away from Abhigyan. The character of Abhigyan is like every girl’s dream hero. I did feel at times that he was too good to be true; such gentlemen are hard to find. Paridhi’s sister and her best friend Geet are very likable characters. The story is quite fast paced – lots of things happening and no dull moments. While it might not work for many – it did work for me as I was looking for a quick, breezy read. If you are looking for a beautiful romantic story for a journey or a light ready in between some heavy reads, just go for this one. A science graduate, she holds a Diploma in Creative Writing in English from IGNOU. 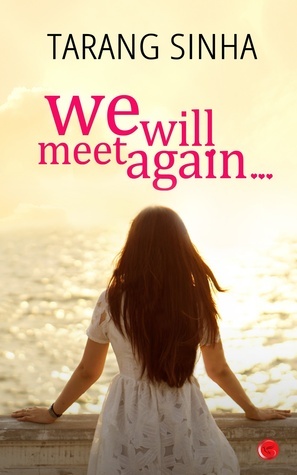 'We Will Meet Again...' is her first novel. This post contains affiliate links which means that if you buy on the site through the links, I may earn a referral commission at no cost to you. Thank you for your support.